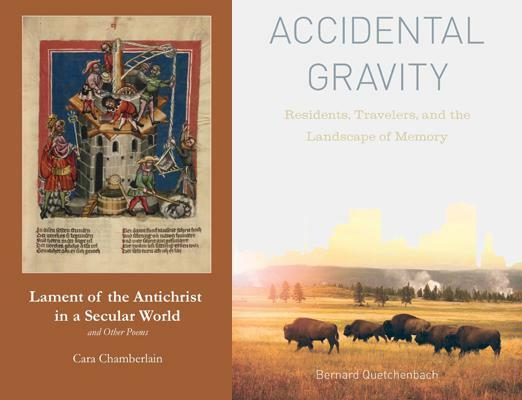 I recently had the good fortune to sit down with poets and dog lovers Bernie Quetchenbach and Cara Chamberlain for Yellowstone Public Radio. As a married couple, their literary lives intertwine in many ways and both released new books this spring. “What we play is the music of circumstance, a ragged, delicate hymn, the soulsong of our shared and lonely lives,” writes Bernie in “Accidental Gravity,” a collection of essays that is part poetic, part introspective, but in fullness a most lovely almost lyrical composition. Cara’s collection of poetry, titled “Lament of the Antichrist in a Secular World,” is wildly inventive with quite the cast of characters – therapists, virgins, prophets, apostles, kings, queens, maidens, feminine archetypes, Satan and the son of god – Adam and Eve, Delilah and Samson, Mary Magdalene, Ezekiel Among the Mall Walkers…to name a few. As well, there’s such a strong sense of place, from the glaciered peaks to the grace of deer, the plowed fields and vanishing farms, subdivisions and retail stores. In our interview on Yellowstone Public Radio, Cara and Bernie discuss their literary household (just like anyone else’s, with probably a few more words rolling about).